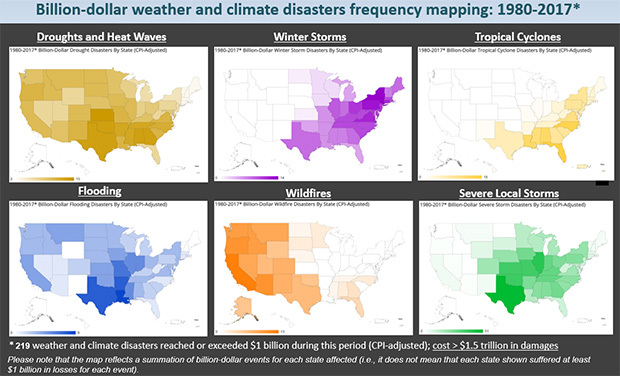 NOAA’s National Centers for Environmental Information (NCEI) tracks U.S. weather and climate events that have great economic and societal impacts (www.ncdc.noaa.gov/billions). 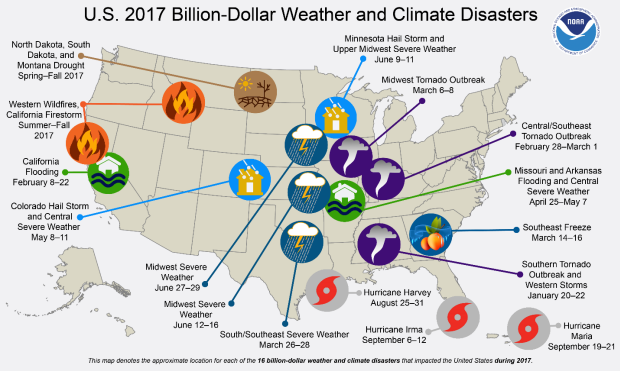 Since 1980, the U.S. has sustained 219 weather and climate disasters where the overall damage costs reached or exceeded $1 billion (including adjustments based on the Consumer Price Index, as of December 2017). The cumulative costs for these 219 events exceed $1.5 trillion. In late-August, Hurricane Harvey caused unprecedented amounts of rainfall (up to 60 inches) over Houston one of America's largest cities. Harvey is the closest modern disaster comparison we have in relation to Katrina in terms of damage costs. Harvey’s costs exceed $125 billion, only second to Hurricane Katrina’s level of damage. Harvey was a category 4 hurricane making landfall near Rockport, Texas and causing widespread damage. (bars) The number (left vertical axis), type (colors), and annual cost (right vertical axis) of U.S. billion-dollar disasters from 1980-2017. (lines) Running annual cost (purple line), along with the 95% confidence interval, and 5-year average costs (darkest purple line). The orange colors were chosen to emphasize the rising contribution of two event types to the total annual costs: severe storms and inland flooding. NOAA Climate.gov animation, based on NCEI data from Adam Smith. The U.S. has experienced a rising number of events that cause significant amounts of damage. From 1980–2016, the annual average number of billion-dollar events is 5.8 (CPI-adjusted). For the most recent 5 years (2013–2017), the annual average is 11.6 events (CPI-adjusted). 2017 ties 2011 for the highest number of billion-dollar disasters (16 events). The increase in population and material wealth over the last several decades are an important factor for the increased damage potential. These trends are further complicated by the fact that many population centers and infrastructure exist in vulnerable areas like coasts and river floodplains, while building codes are often insufficient in reducing damage from extreme events. 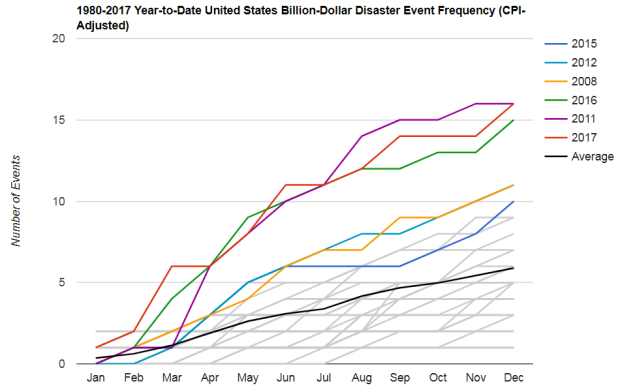 In total, from 1980–2017, the U.S. South/Central and Southeast regions experienced a higher frequency of billion-dollar disaster events than any other region, as shown in the red total disaster frequency map. 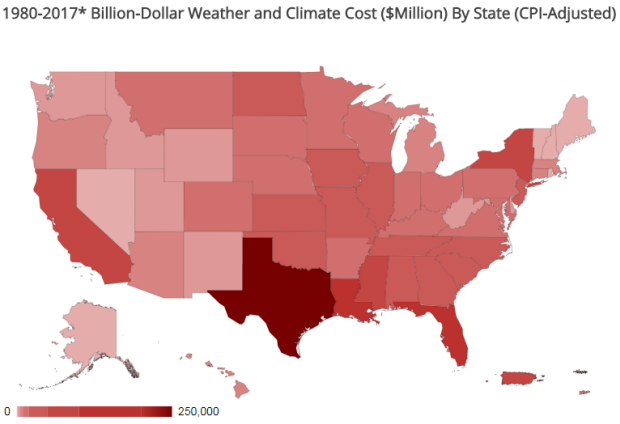 The South region has also suffered the highest cumulative damage costs reflecting the cumulative diversity, frequency and severity of weather and climate events impacting these regions. To be clear - this is an issue of COST, and has nothing whatsoever to do with whether or not these were more powerful storms driven by humans and their Carbon Dioxide emissions. As more, and more expensive, things are built on coasts where hurricanes might strike (even after a 10 year absence of ANY hurricanes) it will cost more to fix them. And the other problem is that the currency continues to be debased so much that a relatively minor storm will cost way more than a similar storm 50 years ago. Compared dollar amounts of storm damage is a completely invalid comparison. Please note that I have edited your original response, which violated our comment policy in terms of civility, but I preserved the substance of your comment. The increase in population and material wealth over the last several decades are an important factor for the increased damage potential. 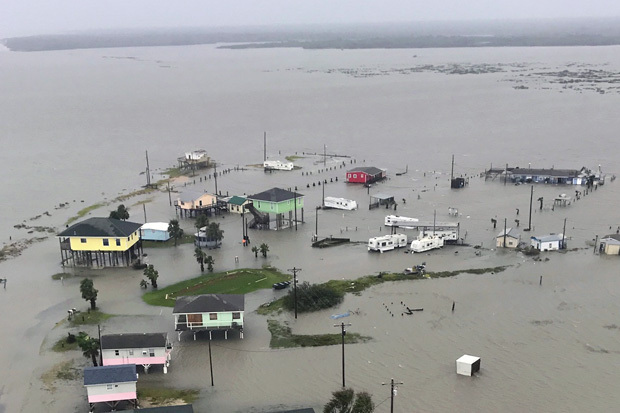 These trends are further complicated by the fact that many population centers and infrastructure exist in vulnerable areas like coasts and river floodplains, while building codes are often insufficient in reducing damage from extreme events. So, as you say, it would not be correct to use this analysis on its own as "proof" that human-caused climate change is affecting the frequency or cost of disasters. However, other research and assessments (like the National Climate Assessment) have demonstrated that certain kinds of extreme events are increasing in frequency or severity due to human-caused global warming. Given that those events are among the ones that are included in these analysis, it is also not correct to say that these events and their costs have "nothing to do with" human caused climate change. This is so irritating. Of course the $$$$ cost of these events is greater than in times past due to inflation. Also, the excessive and unwise building taking place along coastal lands has increased the amount of damage done by hurricanes. You cannot measure the severity of a weather phenomenon simply by counting the cost in dollars. That is far too subjective. 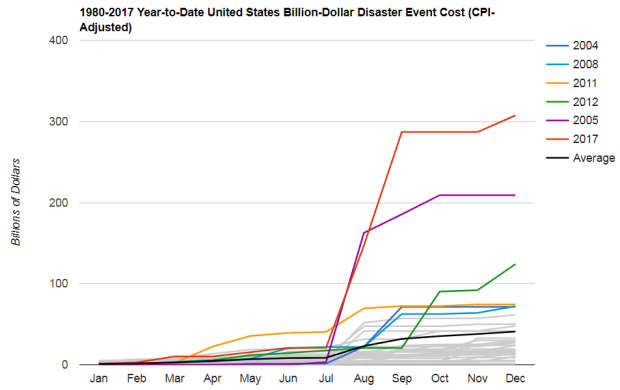 The annual billion dollar disasters analysis is adjusted for inflation, so that costs for all events over the period of record are always expressed in terms of today's dollars. The primary objective of these analyses is not to explain all the causes of extreme weather, which—as Adam says in the post—are numerous. 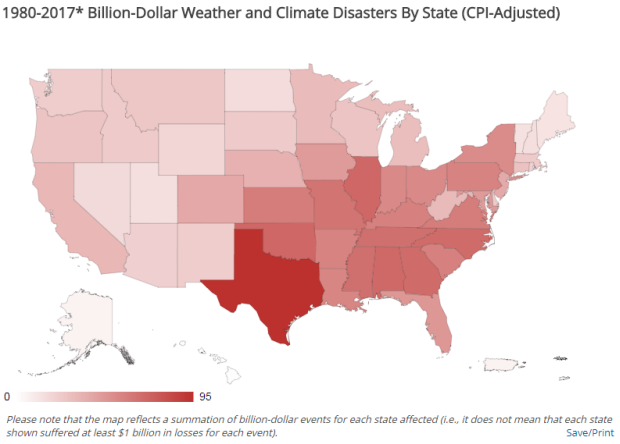 The point is to provide a consistent way to compare the cost of weather and climate disasters over time, which is something that NOAA would be doing regardless of human-caused climate change. Is this a surprise? The number and value of things affected by disasters goes up. Well, whether it is a surprise depends on how you look at, I guess. On the one hand, as population grows and infrastructure expands to support that population, it's true that there are more assets exposed to damage from natural disasters. 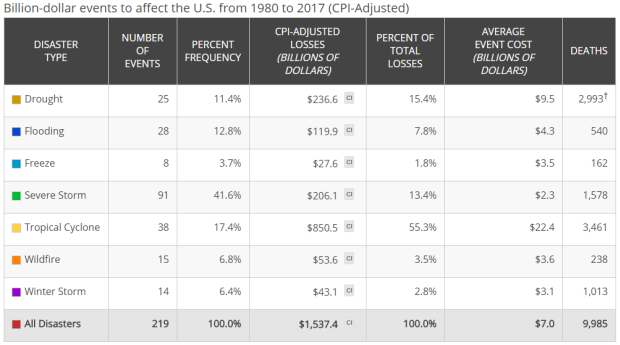 By that token, it isn't surprising that the cost of disasters has risen since NOAA started tracking it consistently in the 80s. But at the same time, it does surprise me a bit that with all our "progress"--the ability to better forecast certain disasters, better understanding of material science and construction techniques, the possibility of drone monitoring, etc--the US hasn't been able to translate that knowledge into a reduction in the costs associated with natural disasters. This is a nothing-burger study. The population of our large coastal counties has doubled in the last 40 years. That is the main reason for higher costs. The 1926 Miami hurricane would surpass the cost of any of last years storms, simple because Miami-Dade has grown 25X since then. Who funds these wasteful, unscientific studies? If researches continue to spew this nonsense, then our young naive reporters will keep regurgitating it. NOAA is the federal agency mandated by Congress to monitor, understand, and predict the weather and climate (among its many other obligations). It is mandated to share that information with the public to help protect the things that are valuable to us, including businesses, infrastructure, and natural resources. This analysis of economically damaging extreme weather and climate events is not conducted for the purpose of climate change attribution. It is simply part of the agency's routine climate scorekeeping (they do it every month!). These monthly reports and annual summaries allows American citizens and businesses to compare one year to another and to put a given year's extreme weather and climate into a long-term perspective. It is an analysis the agency would do even if there were no such thing as human-caused climate change. We are getting some comments on this post that are in violation of our comment policy, not because they are questioning or critical of the analysis, but because they are uncivil, use profanity, include attacks or insults directed at people and not at the science, etc. If you would like to be part of the discussion on this post, and your comment has not been posted, I encourage you to try again to express your questions or criticisms in a manner that makes it clear you are interested in starting a mutually respectful conversation with NOAA scientists and other readers of the Beyond the Data blog. You may always write to us at our webmail address, which can be found on our contact page. This article does not clarify the increased population and the sheer number of new buildings in dangerous areas. 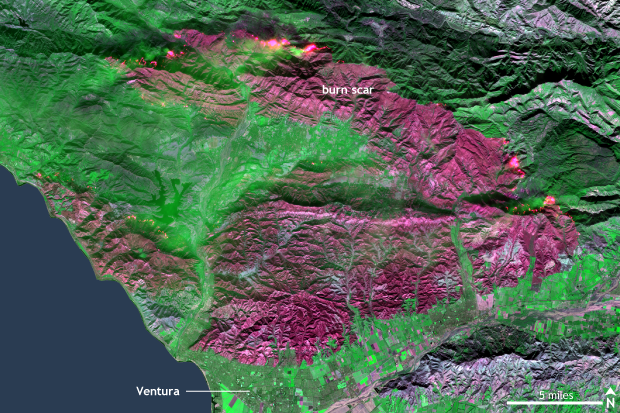 It also doesn't mention the fact that problems caused by past American fire suppression policies (always stop forest fires) are now causing enormous fires that have nothing whatsoever to do with climate, and everything to do with decades to a century or more of remnant fuel, which should have burned off as small fires, but has collected for all those years. The U.S. has experienced a rising number of events that cause significant amounts of damage. ... The increase in population and material wealth over the last several decades are an important factor for the increased damage potential. These trends are further complicated by the fact that many population centers and infrastructure exist in vulnerable areas like coasts and river floodplains, while building codes are often insufficient in reducing damage from extreme events. Good evening. I beg your pardon if I've overlooked the explanation here, but please help me understand the "weather and climate..." descriptors. Why not just "weather?" Thanks much. There is really no universal definition of the time span at which "weather" becomes "climate. " Around the one-month mark, though, the definition of of a phenomenon as "weather" begins to fray a little. We all have an intuitive sense of what's "normal" temperature for the place we live in a given month, but not a given day of a month. In the case of the billion-dollar disaster analysis, there are some categories that are unequivocally weather (individual hurricanes, for example) and others that would stretch the definition of "weather" a little too far, such as droughts that can last for months or several seasons. In addition, the way the report has chosen to handle fires--as a seasonal and regional aggregate--is a little closer to the "climate" end of the continuum than the "weather" end. Many projects have proved that investment to strengthen preparedness in terms of infrastructure and non-infrastructure pay dividends when disasters strike. The invest to build community and local resilience pay more dividends to reduce damage and loss by disasters significantly. In the changed weather and climate, all countries should increase invest to build local resilience, build resilient infrastructure, make degradation of environment ZERO and manage natural resources sustainably. These will help to build climate resilience and overall disaster resilience at state, country and global level. In reply to those who would dismiss the role of climate change in the increasing frequency of weather disasters, all of what we are seeing was predicted as a future consequence of greenhouse gas emissions. There is little other than the effect of increasing greenhouse gases in the atmosphere to explain the change. I am a statistician, as well as having an undergraduate degree in physics. I have looked at sunspot level, carbon dioxide level, and the El Niño Southern Oscillation index (all publicly available) time series. Using multiple regression with time series errors, for a quickly developed model, the model accounted for about 87% the amount of variation in the time series of temperature anomaly that I used. The most important predictor was CO2, the next the ENSO index, and the weakest sunspots. "Using multiple regression with time series errors." I am familiar with multiple regression. However I don't know what you are referring to with "time series errors." Perhaps you can explain. Also, have any (dependent or independent) variables been lagged?